Welcome to the Wooden Ships Charter page. Here we will be advertising a small number of traditional charter vessels operating in various parts of the UK and abroad, each of them offering fantastic experiences and the chance to get hands on with a 'proper boat'! These are all boats we know well, some we have sold in the past, some of them Richard has skippered and has first hand experience of sailing them, but every boat is able to offer a great experience to people of all abilities and experience levels, whether you want to lie on deck and simply take in the surroundings or get very hands on with setting sails, navigating and helming a traditional vessel. 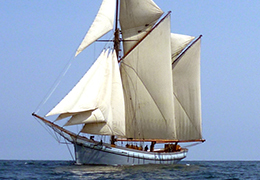 Bessie Ellen is an impressive sight under sail. Built as a cargo vessel at the beginning of last century she is an example of superb craftsmanship combined with a fascinating history. Today, the working life of our ship has changed to provide adventures under sail where our crew are committed to giving you an authentic experience of traditional sailing ships and to share our passion for sailing with you. With short breaks, week cruises longer voyages, this year in Cornwall, the Hebrides and St Kilda we will strive to make your adventure, cruise or holiday voyage an enduring memory. 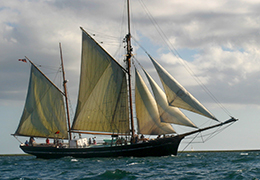 Irene, fondly known through history as the Grey Lady is our second West Country Trading Ketch. Built in 1907 by JF Carver and Sons Irene has been owned and restored by the same family since 1965. Following a complete rebuild lasting six years, Irene is now earning her keep as both a sail training vessel and a sustainable cargo business. She also attends many of the major sailing events on the annual regatta and festival calendar. Details of her future sail training and charter engagements. With short breaks, week cruises longer voyages, this year in Cornwall, Irish Sea waters and Scilly, we will strive to make your adventure, cruise or holiday voyage an enduring memory.